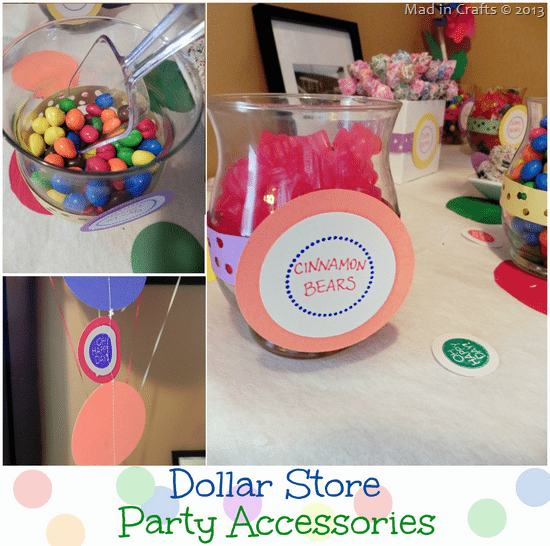 Candy bars are a really fun party trend, but they can be expensive to put together. 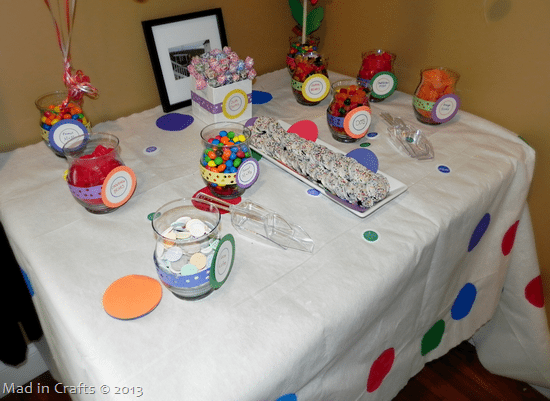 When my cousin Mollie requested a candy bar for her graduation party, her sister and I worked together to give her a candy buffet she would love, without breaking the bank. 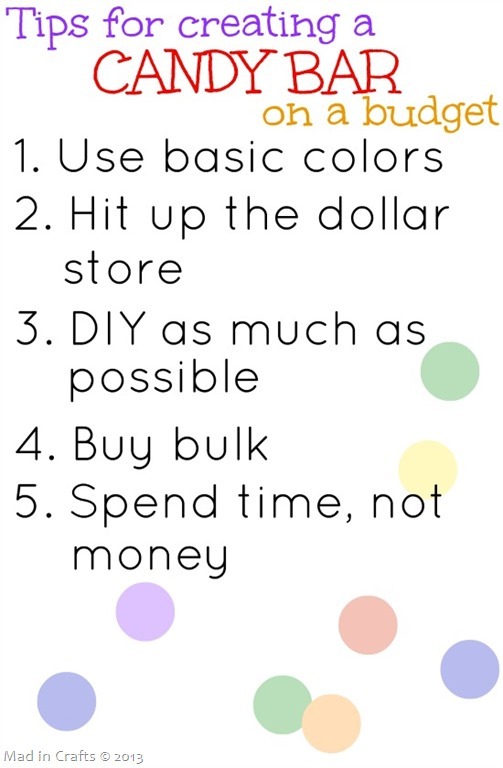 Today I am going to share some of our money-saving tips with you! My cousin and I made up a list of Mollie’s favorite candies. Thankfully most of her favorites are bright, multi-colored candies. It’s actually much easier to create a color scheme around basic rainbow colors, than specific custom colors like coral or Tiffany blue. Because were were going for a rainbow color scheme, I could use cheap construction paper instead of scrapbook paper, and markers and inks I already owned instead of having to buy new. That alone saved quite a bit of money. I had the vases leftover from my wedding reception, but you can also buy glass vessels at the dollar store or find them marked down at craft stores like Hobby Lobby. Another cute option would be to use large mason jars, if you have them on hand. 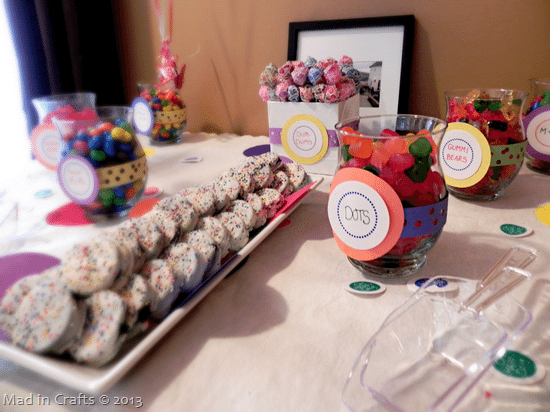 Many of the candies we used are round, so it seemed like the obvious choice was to carry a polka dot theme through the candy buffet. Instead of a precise polka dot pattern, I used a more informal, and trendy, confetti motif. It’s easier to DIY and it has more energy that straight polka dots. My inspiration for the tablecloth was this gorgeous confetti tablecloth from Oh Happy Day. 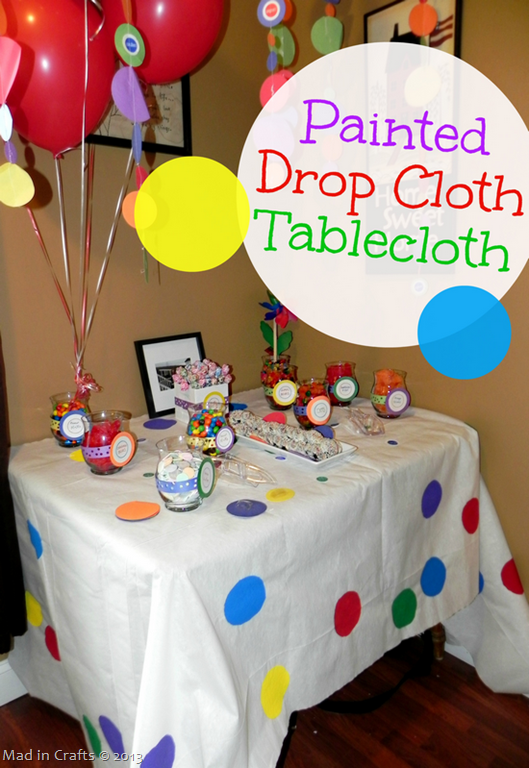 Instead of buying a pricier white tablecloth, I bought an inexpensive drop cloth at a home improvement store and then painted the dots. For a few dollars and an hour of my time, I got a homemade candy bar tablecloth that tied into the theme perfectly. Sure, it would have been less work to buy a polka dot tablecloth, but it would have cost more money too. I always, ALWAYS visit the dollar store before a party. It’s the best place I have found to buy decoration supplies, gift wrap, and other party accessories. I bought the construction paper for the signage and the garlands at Dollar Tree. I also found the clear plastic scoops in the wedding section of DT. We even found some of the candy at the dollar store. When you are using less expensive materials to decorate for a party, it’s important to add in special details wherever you can. 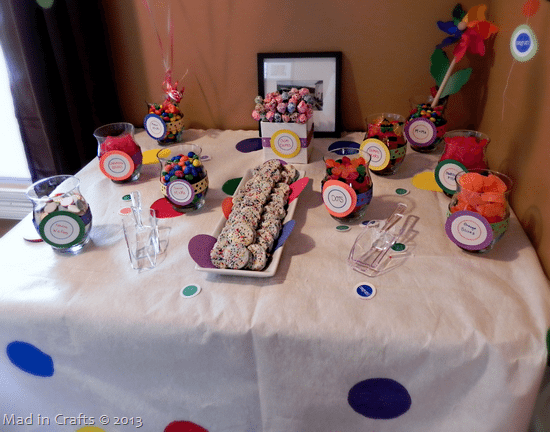 The candy bar signs didn’t need to wrap around the glass vases, but by cutting contrasting colors of construction paper and then punching out a confetti pattern with my hole punch, I added a special detail to tie them in with the confetti dot theme. It didn’t take much extra time, and it was worth the added effort. I also cut out extra construction paper and stamped sentiment circles with my PSA stamps. 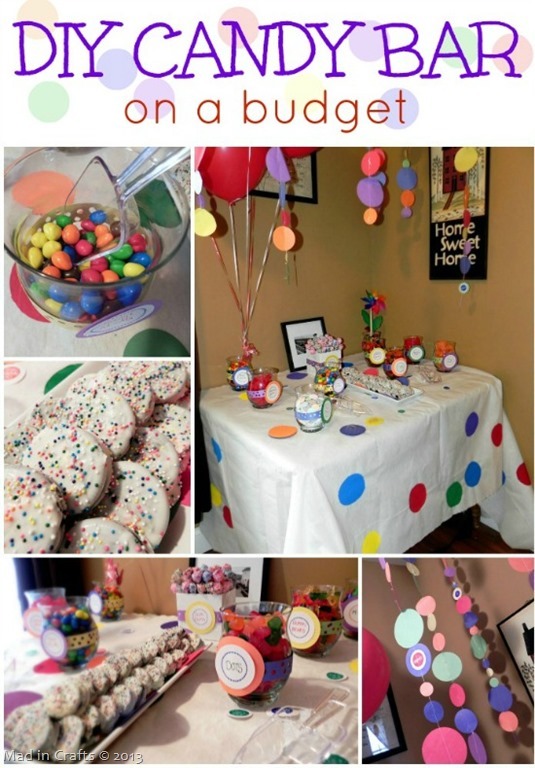 The circles were then scattered around the table like confetti. Custom-made boutique baked goods are adorable at parties, but they are also REALLY pricy. If you are able to take a little extra time, you can make some really fun treats yourself. 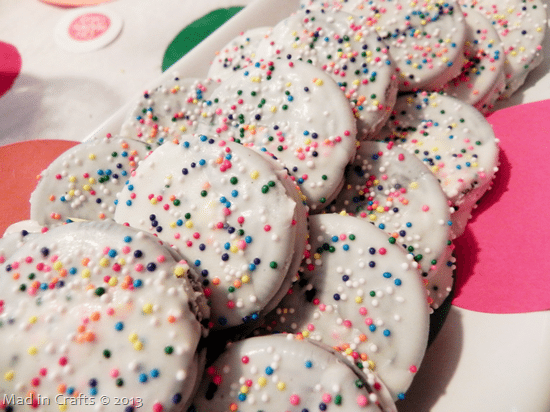 The morning of the party I dipped Oreos in almond bark and sprinkled them with rainbow sprinkles. It took less than an hour, and they were a favorite at the party. 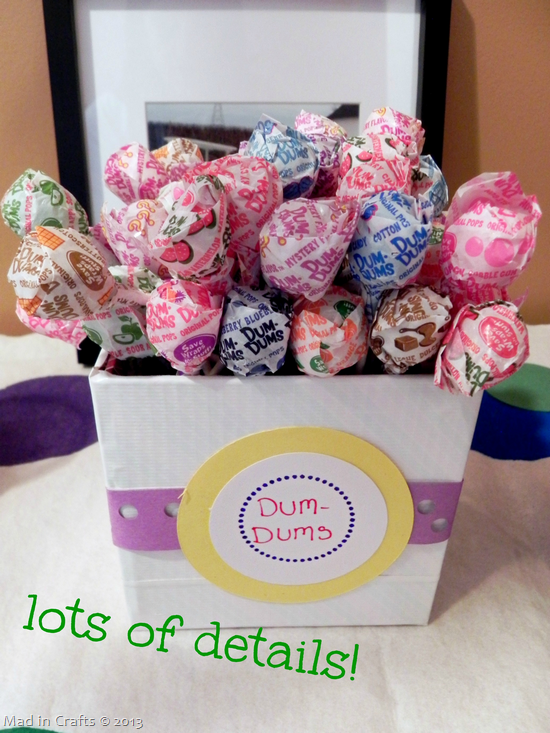 Do you think you might try a candy bar at your next get-together?